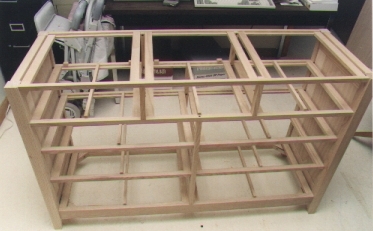 This unit was made from the same stock as that used in the bunk beds. 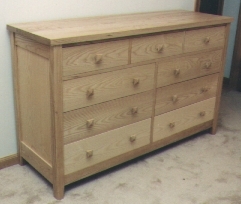 Drawer sides and back are poplar; drawer bottoms and the unit's back are plywood. Here is the inside of the unit during construction. There are no compartment dividers though I wished in hindsight that I had added them. The two sides are made from ash veneered plywood. The top is solid ash and mounted to allow movement. Drawer fronts are continuous side to side to retain grain appearance. The finish is Danish Oil and wax.